The Future of Sound? Dolby Atmos | What Hi-Fi? On Monday night­ Dolby Laboratories invited Whathifi.com to a panel session to discuss its contribution to cinema across Europe. While that may sound (very) dry to most people, for anyone interested in what Dolby do, the discussion was revealing (honest). Hosted by Peter Cowie, film historian and former International Publishing Director at Variety, the talk touched upon the various ways in which Dolby has lent its expertise to film productions; from production to exhibition with a specific focus on Dolby’s new-ish surround sound process, Dolby Atmos. For a more detailed rundown on the inner workings of Atmos, clap your eyes on this past blog about it. And with the 2014 Oscars a few days away and Alfonso Cuaron’s Atmos-mixed Gravity expected to sweep the technical categories, there’s no better place to start than with his spectacular survival film. The clip is from early on as Sandra Bullock’s Ryan Stone and George Clooney’s fellow astronaut Matt Kowalski repair the Hubble Telescope just before they receive an urgent communication from Ground Control. Intially there's not much to the scene with the dialogue coming out of the centre channels and the score not present. That is until a train of satellite debris zips into view causing a massive chain reaction. Despite the lack of sound in space (which Gravity just about respects); composer Steven Price’s ambient score picks up the slack, replacing the sound effects with electronic distortion of brass and string instruments in his score to create the sensation of objects whizzing across the screen or explosions ripping through the space shuttle. The array of speakers positioned above and along the side allows the score to be funneled through, with the Price’s score moving from left to right (and vice versa) or coming in from above to create an immersive 3D soundscape. From the six or so minutes we saw, it’s a forceful and impactful approach (despite occuring in the weightlessness of outer space), so much so that we shifted about in our seat feeling as if we’d just been buffeted about. Granted this viewing took place in an auditorium that’s designed to showcase the best of Atmos, but the overall effect is impressive. While we wouldn’t say that Atmos sounds better than a 5.1 or 7.1 mix, the soundtrack did feel more focused with the speakers on the ceiling giving the sountrack extra space to breathe. The ability to pinpoint the direction and separation of various effects was impressive too, with the dialogue clearly audible despite the score’s rising intensity. Moving on, the next clips showcased other ways Atmos could be applied to a variety of films and not just the technical, bigger budget productions. First up was a film about a boat crew in a round the world race called En Soliatire (Turning Tide in English and the first French film to be mixed in Atmos). It was another chance to show the heft and force of an Atmos soundtrack as the waves crashed against the ship’s hull but the clip didn’t reveal much else tou our ears so we’ll move on. Trance was next and Danny Boyle's slippery film was an altogether different experience. Boyle’s electic mish-mash of sound design, visuals and music is a noted trait of his and in Atmos they combine for an impressive whole. The scene features James McAvoy’s amnesiac art dealer putting the fractured pieces of his memory back together and like before everything sounds solid and full-on, but with a more traditional score in Rick Smith’s Bullet Cut providing a different feel from the clips we've seen. The result is a scene that conveys a terrific sense of energy and propulsion racing towards to the scene’s climax before winding down. It's a good example of not just Atmos itself, but the ability of good sound design to affect a scene’s tempo as well as the emotional content of what’s happening. Experiencing it in Atmos it surrounds, envelops and draws the viewer in for an intimate experience you may not find at your local multiplex. This could be down to Dolby’s screening room being smaller than the main (biggest) screen at your local cinema, but when it works as well as it does here it's an involving experience. Following Trance was a clip from Spanish documentary Guadalquivir (it follows a fox along the Guadalquivir river in Spain). This was a less ‘enthusiastic’ clip, trading an ever-present sense of sound for a more reserved one. The sense of spatial awareness in the clip made it possible to hear the rustle of the leaves in the canopy above, or pinpoint the location of the various animals within the soundscape. It’s fantastically immersive, producing a convincing reproduction of a forest environment and placing the viewer in the centre of it. So you can take from this blog that Atmos is a very immersive format but it wasn't the same approach with each clip. Some were brash, others relied on subtlety. The variety of approaches is something to look forward to if more filmmakers come to use the format. So with Atmos still rolling out to theatres across the world it’s in the midst of a good moment. Althougth with the Empire Cinema in Leicester Square joined by the Olympic Cinema in Barnes (! 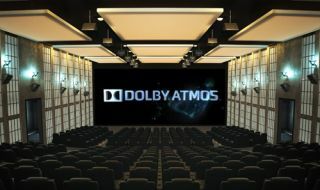 ), as the only two cinemas to have Dolby Atmos installed in the whole of the UK, it still has a way to go before it becomes mainstream. Dolby were tight-lipped when asked during the Q&A as to whether they thought Atmos would eventually replace 5.1 and 7.1 as the soundtrack de rigueur for cinemas but you’d suspect they’d be more than happy if it did. We do wonder how it’d work at home (or whether it'll remain in cinemas). We can’t imagine putting speakers on the ceiling for fear of being squashed like a bug. Nevertheless, with a number of films due for release in the format this year, a list that includes 300: Rise of an Empire, Noah, The Amazing Spider-Man 2 (above), Godzilla, X-Men: Days of Future Past and Dawn of the Planet of the Apes; filmmakers are embracing Atmos and are looking to include it from the beginning of the production process. And on that note, Dolby Atmos has a good chance of coming to a cinema near you.